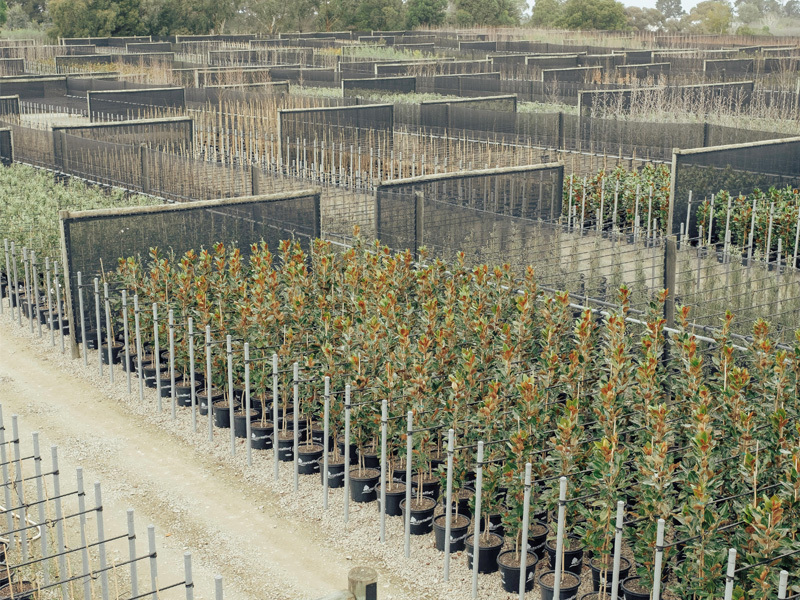 The want for 'instant effect' has created a demand for advanced plants. The larger sized plants that are now available cover many different varieties to be able to give the customer 'Instant gratification' in a wide range of situations. Trees are usually sort after in an advanced size but now we can offer so much more in the way of small, medium and tall shrubs so for your next plant-out you will be able to stand back and the focus will be on the plants instead of looking at an expanse of mulch or soil. Another reason for purchasing advanced plants is the problem solving capabilities these plants offer. Hide that ugly fence, shed or water-heater, or maybe the neighbours. Two factors that 'Instant effect' gives you are Time and Quality. You don't have to wait for the plant to grow, obviously, and it takes out the variables of what could happen to a young plant while growing. The variables include inconsistencies of watering, pest and disease infestations or even storm damage. The structure, strength and vigour of the plant have already been established in the nursery for you. You may end up paying five times the price of a small plant but you can walk away with ten times the plant. A couple of things to consider for success when purchasing and planting advanced plants: Look for quality not price because like nearly everything, you get what you pay for, also you must consider the planting and post planting maintenance. Refer to our easy five-step planting guide for success. Post planting maintenance is probably the most important of all and is very easy. Get into the habit of checking for water rather than just automatically watering. A lot of death in the garden can be attributed to either too much water or not enough. Regular checking solves these problems. One way to monitor is to use a bamboo stake the way you would use a cake tester on a cake. Push the stake into the ground to approximately the depth of the root ball. Remove the stake and it will show you just how moist the soil is. Talk to your retail nursery person or your Gardening/Landscaping contractor if you are unsure of your plants' requirements. Most plants will respond well to a basic all-purpose feed. Some others can require more specialized fertilizers but they are few and far between. Advanced plants are there for your convenience to beautify areas quickly and to solve problems. They will give you 'Instant Effect'. For more information on Instant Effect, please Contact Us today! Thoroughly water the plant before removing it from the pot. Choose and prepare your planting site. Dig the hole twice the width of the pot. Loosen the soil at the hole and mix in slow release fertilizer or compost with the existing soil, and back fill. Remove the pot and slightly tease the roots before placing the plant into the hole at the existing soil level. To aid drainage, when planting in clay soils, disturb the clay by digging in Gypsum (clay breaker). Then mound the top soil (add more if required) and plant into the mound. Back fill around the root ball and firm in, creating a basin the same diameter as the pot, and water in well. At this stage a quality starter can be added to aid transplant success and growth. Consult your Horticulturalist. Stake taller plants until established, placing two stakes opposite each other on the outside of the rootball. Tie with soft material. i.e. rubber tube.